Philip Baldwin, associate professor of music and director of Whitworth’s orchestra, says his goal for the tour was to create an educational and musical experience for the orchestra students, connect with Whitworth alumni, and provide outstanding concerts in some of the best and most unique performance venues on the East coast. The orchestra will perform the overture to The Merry Wives of Windsor, by Otto Nicolai, the Slavonic Dances, Op. 46, by Antonin Dvorak, and Jean Sibelius’ Symphony No. 2 in D. A free-will offering may be taken at each performance. All concert performances are open to the public. Each venue of the tour was selected for its historical background, beginning with the National Presbyterian Church, 4101 Nebraska Avenue N.W., in Washington, D.C., on May 19 at 7:30 p.m. The church was founded in 1795, and has been visited by Frederick Douglass, the British royal family and Mother Teresa. On May 20, the orchestra will host a clinic for students at T.C. Williams High School, in Alexandria, Va. The school is known not only for its academic excellence but also for its football team, which served as the inspiration for the film Remember the Titans. On May 22 at 7 p.m., the orchestra will perform in the Torrance Atrium of the New Library, 25 Library Street, at Princeton Theological Seminary in Princeton, N.J. Founded in 1812, the Princeton Theological Seminary was the first seminary established by the General Assembly of the Presbyterian Church. 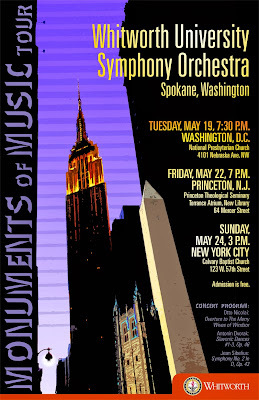 The final concert will be held on May 24 at 3 p.m. at Calvary Baptist Church at 123 W. 57th St. in New York City. The church was founded in 1847 and moved to Manhattan in 1883. Calvary was one of the earliest churches to operate its own radio station in 1923 and has a long tradition of widely followed religious broadcasts. The famous piano virtuoso Van Cliburn attended its services and donated two Steinway pianos to the church. Cello and bass instruments are graciously provided by Princeton Violins and Brobst Violins. Joan Lack, tour coordinator, Whitworth University, (509) 777-4847 or jlack@whitworth.edu.